Radhika Nagpal’s research draws on inspiration from social insects and multicellular biology, with the goal of creating globally robust systems made up of many cooperative parts. Harvard President Drew Faust has approved Radhika Nagpal for promotion to the role of full professor with tenure at the Harvard School of Engineering and Applied Sciences (SEAS). 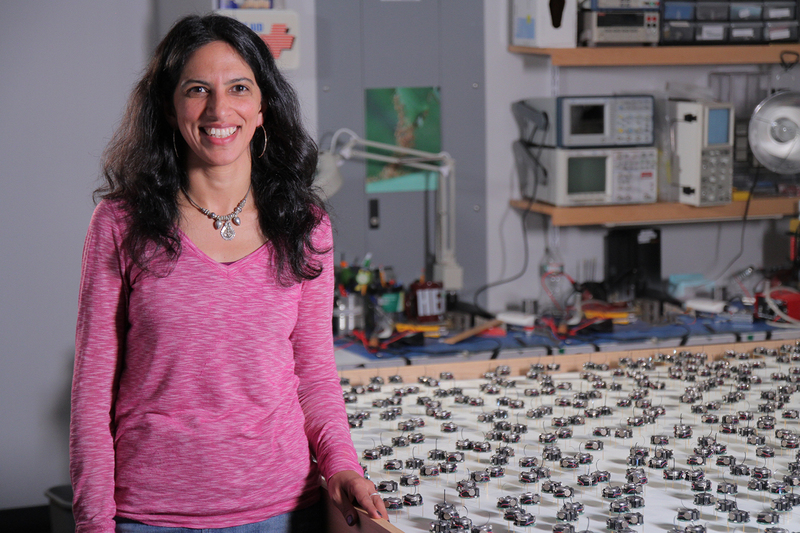 Nagpal is a Core Faculty Member at the Wyss Institute and a co-leader of the Institute’s Bioinspired Robotics platform. She is also the Thomas D. Cabot Associate Professor of Computer Science at SEAS, where she heads the Self-Organizing Systems Research Group in the study of collective behavior in biological systems and how such behaviors can be applied to computing and robotics. Her research draws on inspiration from social insects and multicellular biology, with the goal of creating globally robust systems made up of many cooperative parts. Nagpal also investigates complex biological systems through mathematical and computational models. Discoveries in these areas have applications in computer networking, robot swarms, and sensor networks. Her team’s research is credited with the Kilobots, tiny, inexpensive robots that are designed as a tool for understanding complex, distributed systems. The Kilobots’ design allows researchers to manage large numbers of the tiny bots, where previous research was limited to smaller numbers or computer simulations.